I'm feeling a need to write so I thought I would share a few things I love about running. I love that my nine year old son talks to his friends about me being an Ultra Runner like its "really cool". I love that my wife says she is not a runner; although she will run home from work (that's from Downtown Charleston, over the Cooper River Bridge and to Mount Pleasant), has run a ton of 5k's, has run several half marathons and has run a marathon. I love being in better shape now than I was in my 20's and 30's. I love that I have friends who will show up at 4:30am for a run even if its cold and raining (although, they will complain about it). I love that I am 42 years old and my mother stills says she is proud of me for inspiring others. I love that I can run at lunch. I love that people let me coach them to run. 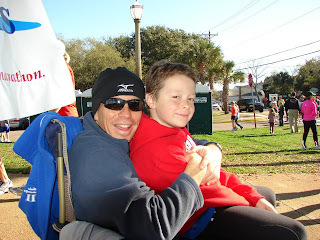 I love that my son likes to come to my running groups (one day on our way home he said, "I really like those people. I really like runners."). I love seeing people I coach reach their goals (I like seeing people I don't coach reach their goals too, don't be so cynical) . I love that I have co workers who run now. I love that I can walk into a running store (TrySports) and they know my name and shoe size (okay that part's a little creepy, but you get what I'm saying). I love that my son feels so comfortable at a race that he will get a massage just like any other runner. I love that running is an adventure every time I go out the door. Make that 3!! I love your blog and thoughts on running. Let me add to your list... I love how this area has so many choices for running ... from 5k to 50 miles, you name it, we've got it. Haha I love that comment about just your mom and someone else! I feel like that too sometimes, except my mom doesn't read so it'd be my husband and someone else! I love how Peyton could legit circle that 50 miles is the distance someone would most likely race on a test... that meme you shared with that, good stuff ;). Thanks Arthur! Great blog too!